After passing 3rd reading in the House of Commons on May 30, 2018, Bill C-262 moved to the Senate where it needs to pass through three more readings before it can become law. This private member’s bill will ensure that Canada’s laws are aligned with the UN Declaration on the Rights of Indigenous Peoples. Developed by Indigenous representatives from around the world over a 25-year period, this declaration enshrines rights constituting the “minimum standards for the survival, dignity and well-being of the indigenous peoples of the world.” The Canadian Truth and Reconciliation Commission, in its 94 Calls to Action, called on the federal government to adopt and implement the declaration as its framework for reconciliation. Many Canadians have supported this bill over the last two years encouraging their MPs to vote in its favour and written to the Senate, but more action is required. If this bill does not pass third reading in the Senate before the federal election is called, the bill will die, and all progress of this bill will have been in vain. Thank you to everyone who has acted to support Bill C-262. Let’s make sure that the senate understands the wide support of this bill by Canadians. Write a letter to the senate here and find more ideas of how you can act here. An Election Year: A key opportunity to engage! It’s that time again – a federal election is set for October 2019! October is still months away, but election buzz and preparation are already in full swing on Parliament Hill. An election year is a great time to get engaged with Parliamentarians on key policy issues. As parties are developing their platforms, MPs are in full listening mode. Sometimes It’s easy to get lost in partisan politics, but we want to encourage you, on your own or in conversation with others, to start thinking about the issues that matter to you – issues that speak to your heart and speak to justice, peace and human dignity. 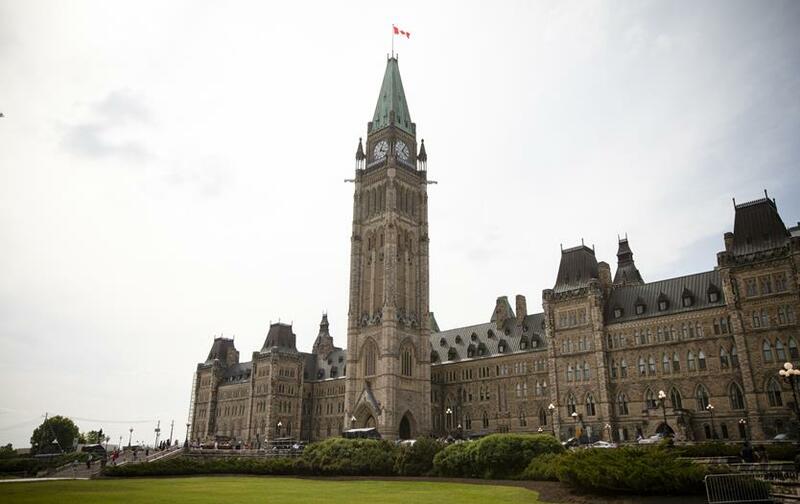 Make sure to check out MCC’s Advocacy Toolkit for tips on how to engage with your MPs: contact their offices, set up a meeting, make the case for your key issues. Remember, they represent you and your interests, so don’t be afraid to reach out! Finally, as we get closer to the official election campaign, stay tuned for more resources from MCC, including suggested questions for candidates, profiles of issues connected to MCC partners, and other ways to get involved. For a taste of these resources, check out our 2015 Federal Election Resource. This past week Charity Nonkes, our Advocacy Intern, and Rebekah Sears, our Policy Analyst, had the opportunity to engage with MPs and NGOs at an event with the Canadian Council for International Co-operation (CCIC) for International Development Week. The CCIC organized a Hill Day to celebrate Canada’s international development accomplishments and areas of improvement. This included meetings with Members of Parliament to learn about their views on Canada’s participation in international development and for NGOs to suggest best practices and policy changes. 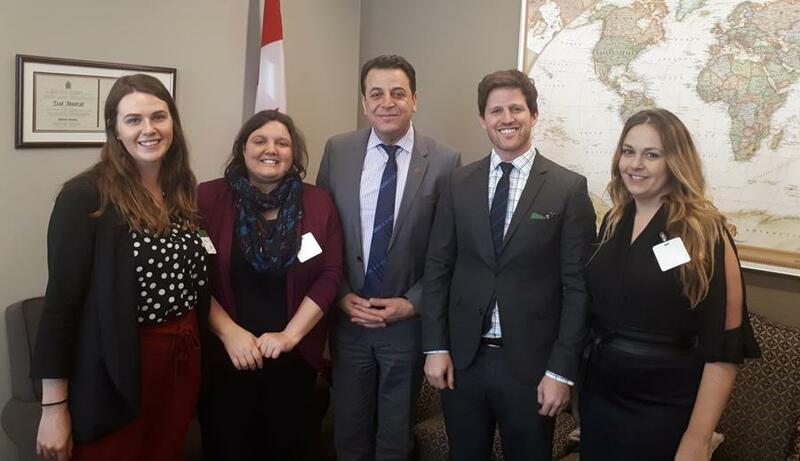 Alongside members of Global Citizen, Charity and Rebekah met with Ziad Aboultaif (Conservative MP for Edmonton Manning) to discuss international development and the work of MCC. Events like this show the importance of advocating for policies that support justice and sustainable development. Policies and public perceptions on topics such as migration, foreign aid, and international development can shape NGO programming. International Development Week is one example of a space where multiple groups can come together to continually weave this web that strengthens our collective voice for justice. Based on share of its national income, Canada gives about half the amount given by like-minded countries and only about a third of the globally agreed amount. 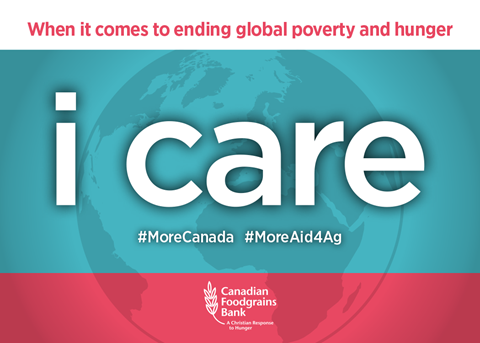 Canadian aid makes a difference! Take action and ask the government to increase the aid budget by requesting your postcards from CFGB. 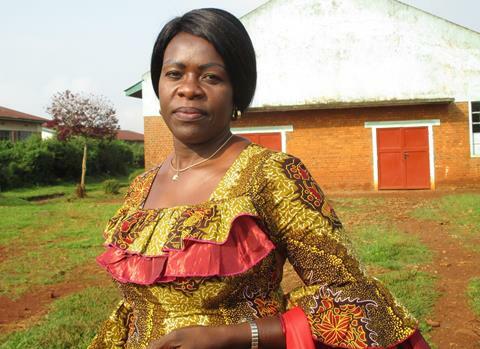 Women Peace Builders play a crucial role in creating resilient peace in conflict zones. The work of these women requires long-term, stable and predictable funding. Write a letter to your MP to ask for an increase in international assistance and an increase in funding to women peace builders here. Last month Policy Analyst Rebekah Sears participated in a panel discussion at Capitalyze conference in Ottawa on the importance of service and advocacy as part of work & faith. On February 5, Director Anna Vogt spoke at the Laurentian Leadership Centre in Ottawa on gender and peacebuilding sharing some of her experiences in Latin America.